While diesel has been the traditional fuel choice, many healthcare facilities are now using natural gas or bi-fuel generators, upon approval of the AHJ, to meet runtime requirements during times of crisis. Bi-Fuel is a great option for healthcare facilities because it provides the best of both worlds. You meet the on-site fuel requirements of NEC 700 and NFPA 110 because you have a diesel storage tank, but obtain the benefits of longer runtimes as the generator transitions to natural gas under load. Generac offers fully integrated solutions that are the only EPA-compliant generators straight from the factory in both the 500 kW and 600 kW nodes. These units can also be paralleled to create even larger kW requirements. Natural gas generators are also being specified for many healthcare facilities, as the permitting requirements are easier. In addition, more AHJ’s are now considering the natural gas pipeline network to be an acceptable on-site fuel storage, as this strong underground network is rarely impacted by weather or other crisis events, allowing you to meet code requirements related to having a reliable fuel source. Another advantage is that there is less maintenance associated with natural gas generators. Generac’s innovative Modular Power System (MPS) can provide the needed large kWs for hospitals along with the benefits of redundancy, scalability, and safety, through integrated paralleling. While it rarely happens, should your single large kW backup generator fail in an emergency, lives are at risk. With Generac’s MPS, you have at least one other backup/emergency generator operating to ensure critical operations continue. This means the kW requirements of the smallest genset in the paralleled system is sized appropriately to meet those needs. With our unique MPS, you can also combine generators using a variety of fuels such as diesel and natural gas. This not only gives you the benefits of genset redundancy, but now you have fuel redundancy as well. Generac’s MPS approach does not require dedicated switchgear sections. Future expansion generators simply tie directly to the generator bus. Because the paralleling is already built into our generators, the MPS system fundamentally has greater flexibility for growth, requires less electrical room space, and reduces initial capital cost. 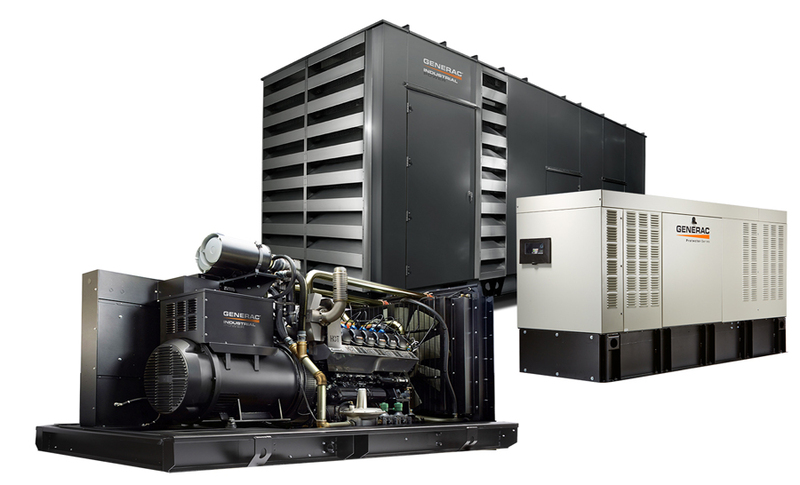 Whether it be multiple generators in parallel, or a large single engine generator, Generac has the product solution to meet your requirements. Diesel generators require constant care. With engine requirements for low-sulfur diesel fuel, the fuel now needs to be re-conditioned every 12-16 months to ensure stability and ease of flow. This fuel requirement, along with the maintenance of the exhaust after treatment system, requires an experienced facility manager to handle this process. If you do not have this person on staff, you would need to turn to a third-party provider for the service, which will add cost. It will also require the rental of a backup generator during servicing when not using a MPS solution. To reduce the maintenance burden, many short and long-term care facilities are turning to natural gas generators, as they need little maintenance. They are also eco-friendly with fewer emissions and a smaller carbon foot print. Generac has more than five decades of experience in working with health care facilities—it’s one of the reasons we have expanded our product line to meeting ongoing needs. We have added large kW diesel generators to meet growing power needs. At the same, we developed innovative natural gas and bi-fuel generators, providing longer runtime to meet code requirements as well as provide extended protection for patients, staff, and visitors. Your patients and staff depend on you. Now, you can depend on Generac. For more information, contact South Shore Generator in Wareham, MA. After the main engine, the most expensive single piece of equipment aboard is often the generator, AKA marine genset. Moreover, a marine genset can log two or three times as many hours as your main engine(s), so choosing the right one is an important decision. You’ll want a generator that’s reliable, offers longevity, and delivers a comfortable time on board. Choosing the right marine genset can be easy if you work with a generator dealer and analyse your requirements carefully. This guide to choosing the right generator will familiarize you with a few terms and help you acquire a basic understanding of the different types of generators and how they operate. The choice is really dependent on your application. If you primarily have a battery charging application then a lot of people put small generators in just to charge batteries, so you have to go ionto a mains powered battery charger and then to the batteries. If you go to a specifically designed DC charging battery generator the efficiency will be higher, the size and weight will be smaller and you pick up the advantage of a variable speed generator. A lot of the earlier DC generators where simply a diesel or petrol engine with an automotive alternator, which by today’s standards was inefficient and noisy. New technology has seen the development of alternators that are highly efficient. Inverters change DC electricity from your battery bank into AC power to run your AC equipment. Inverters work well for vessels that have relatively low power demand (1000-3500 watts) for short time periods. Boats with larger, consistent power demands and electric motors require a generator or both generator and inverter. Engine, Hydraulic Drive, or Both? Powered by a hydraulic pump on the main engine, hydraulic drive generators are best suited to boats with small, intermittent power requirements or long range cruisers. Generally, it is best to rely on a hydraulic generator when only small amounts of power are necessary because operating the main engine for electricity alone is inefficient. Electronic equipment is designed to consume electrical energy with a fixed frequency. The international (SI) unit for frequency is hertz, symbol Hz, which is equal to one cycle per second. The United States and Canada use 60Hz power. A modern 3000 rpm engine is very fuel efficient and comes with a long life span. They are significantly smaller and lighter than 1500 rpm generators and while the engine life is probably a little shorter the chances of doing enough engine hours to wear one out is unlikely. The average genset hours on a cruising boat is probably around 100-150 hours a year and the typical life of a modern 2-3 cylinder high speed diesel is probably between 3000-4000 hours. With a proper sound capsule and engine isolation mounts, it will be as quiet and smooth as a 1500 rpm unit. Gas or Diesel Marine Genset? You’ll need to decide whether to buy a petrol or a diesel generator. If your main engine is a diesel, your genset should be, too. Keep in mind that the explosive nature of gasoline requires a spark-free generator, and therefore a diesel genset is a safer bet for a petrol main engine as well. Liquid cooled generator engines are engineered to be used in a marine environment, and they are available in three configurations: heat exchanger, keel cooled, or direct seawater. Your generator should have the same type of liquid cooling as your main engine. Marine gensets that are heat exchanger cooled feature two cooling water circuits. The “seawater cooling circuit” includes a rubber impeller or centrifugal pump that moves water from outside the boat, through a heat exchanger, and back overboard, often through the exhaust elbow. The “jacket water (also called freshwater) circuit” has a circulation pump that moves a coolant mixture continuously through the engine block and exhaust manifold (where it cools them) and heat exchanger, where it is cooled by the seawater. Keel cooled generators have only the jacket water circuit. A circulation pump moves the coolant through a cooling grid on the bottom of the boat. Keel cooled generators require their own keel cooler so they are not tied to the main engine’s grid. Marine gensets with in-line 4-stroke engines, whether diesel or petrol, are easy to install and service. Since four-pole generators operate at low rpms, the engine needs to produce its maximum torque near or below the operating speed. Automotive engines produce maximum torque at higher speeds. For example, when they run at 1800 rpm, almost all automotive engines are working at a point below peak torque, which will limit the engine’s ability to pick up extra loads such as watermakers, air conditioners, or refrigerators. Engines that are made for heavy-duty, industrial applications offer you strong, reliable low-end torque and provide the power to pick up supplementary electrical loads, even when running at full power. The penalty of course is extra size and weight, which can be quite significant. If you are looking to produce under 10 kW with a 3000 rpm engine then you are still able to run a 2-3 cylinder unit, while if you are wanting the same from 1500rpm the requirements are generally for a four cylinder engine. As engine technology has developed in recent years, the negatives against high rpm small diesel engines has certainly been diminished. Cast-iron, liquid cooled exhaust manifolds increase safety. Dry manifolds can be a fire hazard. If there is a turbocharger, make sure it’s liquid cooled. All service points should be gathered on one side for easy maintenance. This also allows the non-service side of the generator to be installed directly against a bulkhead to save space in the engine room. On larger machines, choose one with liquid cooled, replaceable cylinder liners. This will dramatically lower rebuild costs. If it’s a smaller high rpm diesel it may be cheaper to simply replace the engine. You will also benefit from having safety shutdowns for high water temperature and low oil pressure on your next generator. L ook for a design that eliminates unnecessary, troublesome equipment such as hoses, belts, and gaskets. Marine gensets produce either single-phase or three-phase power. Three-phase motors are less expensive than singlephase motors. And while three-phase power is better for motor starting and running, 20kW generators and smaller usually feature single-phase motors. Until recent times fixed RPM generators have been the only technology available. Regardless of whether they are low speed (1500/1800rpm) or high speed (3000/3600rpm) they have the same drawback. That is, the engine can only deliver the power available at one particular rpm. In the case of the low speed generators this results in a large engine being required to develop relatively small amounts of power. In the case of the high speed generators the compromise is on engine noise and engine life, although in reality neither is an issue on some models. Selecting the right size generator for your vessel is critical. If it is too small, it will wear out quickly, produce excessive exhaust smoke, and potentially damage electrical equipment. If it is too large, it will run under-loaded, lead to carbon build-up in the combustion chamber, leave unburned fuel in the exhaust, and operate inefficiently. A generator should never run continually with less than a 25% load. 35% to 70% is optimal. Two generators may be the best answer for boats with varying power requirements. You can use a higher kW generator for high demand periods and a lower kW generator for times when power demand is minimal. Another option is to use a medium size generator that runs singularly or together with paralleling switch-gear or a simple split bus distribution panel. It is best to have your generator dealer perform a load analysis of your vessel to determine what size generator you require. Your dealer will need the wattage requirement listed. Use this formula to calculate wattage: amps x volts = watts. Turning on appliances that utilize electric motors produces a current inrush, which can cause voltage and frequency dips and lights to dim. Depending on the quality and size of the motor being started, the amount of power necessary to start the electric appliance can be up to ten times its running wattage. This is why it is so important to supply your dealer with both the starting and running wattages of each motor. We can help calculate the electrical load of all the equipment you will run at one time. For more information on marine generators, contact South Shore Generator in Wareham, MA. KD SERIES is the newest line of generators powered with advanced KOHLER diesel engines. The generator sets unprecedented power density make this new line ideal for needs which are constantly more demanding. With a wide range of powers (800-4200 kVA / 800-4000 kWe), they are ideal for every industrial power segment use and benefit from the KOHLER worldwide quality of service. As a global leader in the power market, KOHLER now designs its generator engines. KOHLER has brought their many years of power generator experience into the development of these engines, making the KOHLER engine ideal for power generation. It controls perfectly its production cycles (engineering, tests, maintenance…) that it brings to its highest level of requirement. KOHLER has been a global leader of energy solutions since 1920. Our emergency, prime, continuous and energy management products along with transfer switches and switchgear systems excel worldwide and in all sectors: data centers, hospitals, mines, water treatment installations, industries, administrations, etc. For more information on KOHLER Diesel powered generators, contact South Shore Generator in Wareham, MA.